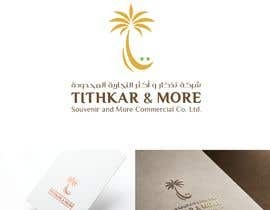 Branding for a Saudi Souvenir Company " Tithkar & More" " تذكار و أكثر"
•	A full Branding package including the Logo and its applications along with the company name in both Arabic and English. •	The Brand should translate the company’s personality being Luxurious, Unique, Original, Creative, Quality providing and Trustworthy. •	The Brand should be produced in different color versions i.e. a) CMYK, b) Pantone color c) Black, single color d) White version with application of different materials such as Wood & Metal Engraving. •	The Branding Package to be provided in Vector (ai, PDF and EPS), Jpeg and PNG with different Lock-up variants to be ready for immediate application. Note: Designers should provide the logo idea and a sample mockup first before completing the full branding package to avoid wasting their time if the design does not qualify initially. Tithkar & More is a Souvenirs and Gifts Company under incorporation in Riyadh, Kingdom of Saudi Arabia. The company is being established to Improve the experience of Saudi Arabia’s visitors, especially the pilgrims and visitors of the two holy cities of Makkah and Madinah, through producing Quality, Value for money Souvenirs that will catch their memories. Tithkar & More strategy is in full alignment with the ambitious initiatives of the Kingdom’s vision 2030. To be the number one Souvenirs and Gifts Company in Saudi Arabia. A. Improve the experience of Saudi Arabia visitors by producing Quality/Value for money, Easy to travel with, Distinguished variety and proud to display Souvenirs that will catch their memories. B. Satisfy requirements of Corporates in Saudi Arabia in terms of providing creative gifts. Can you please explain what do you are trying to say? sorry can you explain what do you are trying to say ?